Team Magic electric touring ? Anyone know what happened with the announced E4 Team magic touring electric ? Right now im in Colombia and even when im an offroad guy i will start to race 19T electric touring and here 9 of every 10 cars are XRAY T2 but i want to try something new (i used to race Team Magic G4 nitro onroad so i know the TM quality). i seen what happens on the tekin website when u give estimated times. there abusive on here. lol! i just know from the R&D that goes into Team Magic Products which Is Second to none .That the E4 will be a big Player in the electric tc market very soon. You got PM Dennis !! Today(July6) spoted new proto of Team Magic E4. Servo/RX/ESC on right side, next to battery. 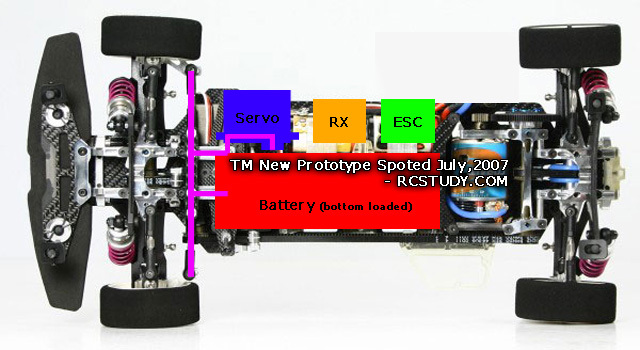 Servo placed similar to Xray/Corally, turn 90deg. It will make its debut soon .They concentrating on getting the M1-B sorted out for know.Then again any new product can be delayed to make sure its right and im sure TM dont want teh same situation they had with the M1-B. nice, e4 will come very soon, but could you tell us the estimated date to arrive this nice electric car, due their gp rival Serpent will come also his electric one, maybe team magic will also available in the similar season as Serpent, don't you? Serpent electric will arrive next month or so ... E4 when ? Just curious is this electric or nitro? What electric stuff are you planing to offer for sale. If it's electric great.Any pictures or information?Is your car American made or imported? This car, if it comes out, should change the game as we know it. I dont know about three belts, but if the car is durable, look for some serious "copy-catting" from the other big guys i the game. looks familiar. a little bit jrx-s type r and a little street weapon. i can definitely see why they added the 3rd belt to get the arms longer. A few pics of the prototype. Like pointed out above there is a planned revision to the layout so these pics are just to point out what the build quality looks like and general idea behind the car. Last edited by razzor; 07-24-2007 at 11:10 AM. All times are GMT -7. It is currently 07:14 PM.